Because of advances in medical technology, the treatment of varicose veins has gone from being a painful procedure that require a stay in the hospital to quick and relatively comfortable outpatient treatments that can be done in the doctor’s office. One of the latest ways to correct varicose veins is through laser treatment. 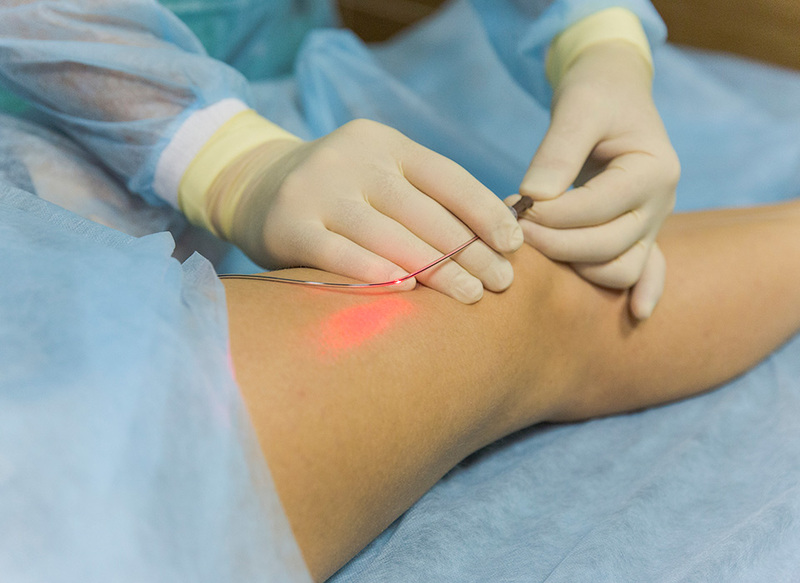 How does laser work to treat varicose veins? The treatment that most doctors use for to treat varicose veins is called Endovascular Laser Ablation, or EVLA. This technique shuts off the largest vein in the leg, which is the saphenous vein. It can also close off its branches. In the past, these veins would have had to have been stripped, which means they were tugged out of an incision made behind the patient’s knee or in their groin. Now, the doctor makes a small incision and uses ultrasound to thread a laser fibre into the vein. The fibre is finally stopped at the top of the vein then turned on and slowly pulled out. The heat from the fibre as it is pulled down the vein destroys it. Are all varicose veins suitable for laser treatment? Not all veins are suitable for EVLA. Your physician will examine you to find out which veins are causing you trouble. Whether the vein can be treated with EVLA also depends on its anatomy. Does the patient need to be put to sleep for EVLA? Generally, a patient doesn’t need general anaesthesia for EVLA. The doctor gives them local anaesthesia, which means they are awake during the procedure but do not feel pain. The patient may feel some tugging and pressure as the vein is being treated, but they should tell the doctor if they feel actual pain. How long does EVLA take? EVLA usually takes about 45 minutes. Does the patient need to stay in hospital? After EVLA the patient does not need to spend the night in hospital. Though the treatment lasts less than an hour, the patient should prepare to spend at least two hours at the medical facility. After this period of rest and observation they can go home, and recuperate from the procedure there. After the patient is prepared for the treatment, the doctor marks the area on the leg that is to be treated. Then, they inject the patient with a local anaesthetic to numb the area. They insert a needle into the vein in the groin area. This is followed by a guide wire and finally the laser fibre. The doctor refers to an ultrasound monitor to make sure that the fibre is in the right vein. The doctor injects the patient with more anaesthetic to make sure that they are completely numb. There are usually about four to five of these injections. The laser is then turned on and slowly withdrawn. During the session, the medical staff and the patient wear protective goggles to protect their eyes against the intense laser light. The doctor may strip out some of the veins found right beneath the skin that are connected to the vein that’s being treated. The doctor or the nurse wraps the patient’s leg in a compression bandage after the laser has been pulled out. They also encourage the patient to walk around right after the treatment to prevent blood clots. The patient needs to wear the compression bandage for two days. After that, they’ll wear a support hose. This is worn 24 hours a day for two weeks then only in the daytime for another two weeks. How is the surgical wound closed? The surgical wound is closed by skin glue or a sticking plaster. They might be washed away in the shower, but that’s not a problem. However, the patient should wait until the compression bandage comes off before they bathe. The compression bandage should not get wet. Does it hurt after the anaesthesia wears off? The patient may feel a bit of discomfort after the anaesthetic wears off. Some patients feel a sensation of pulling that affects the inside of the thigh after a week, but this does not last. The doctor can prescribe painkillers if the patient thinks they are necessary, or they can be bought over-the-counter. These painkillers are also anti-inflammatory medications, which help keep the inflammation under control as the surgical wounds heal. If the patient has any condition that contraindicates taking the anti-inflammatory drug, they need to tell the doctor. Indeed, it is best to tell the doctor about any pre-existing conditions during the consultation before the treatment. How long is the recovery after EVLA? The recovery time varies from patient to patient, but most patients can return to work after three days or so. The patient has a follow-up appointment with the doctor soon after the session to make sure that all is well. After that, the patient should feel free to contact the physician if they have questions or problems regarding their varicose vein treatment. What about walking, driving and flying? The physician encourages the patient to walk around as soon as they can after the surgery. The patient should resume driving as soon as they know they can slam on the brakes without pain. When it comes to flying, doctors recommend a wait of about six weeks before getting on an aeroplane, especially if the patient will be on the aeroplane for a long time. They can go back to swimming once the compression bandage can be taken off and back to sports and strenuous exercise once they no longer need to wear the support hose.